Creating an operating system is an ambitious project. Even putting together an OS based on Linux or BSD takes an enormous amount of effort (and talent!) But creating an OS from scratch — especially one that disregards some of what may loosely be termed 'conventional wisdom' — is probably not something most developers would attempt. That's not to say it doesn't happen — the creators MenuetOS, for example, wrote an operating system entirely in assembly language. Like Menuet, Syllable is an attempt to do make very different to the thousands of varieties of Linux and BSDs available. While Menuet is almost a kind of programming-as-art — skilled assembly language programmers are relatively rare these days, and the system's architecture means it's super-fast and super-compact — Syllable is an attempt to strip away much of the detritus that accompanies desktop operating systems. "Coffee machines and other special-purpose devices usually succeed in doing what you want, but many people can't escape the feeling that their personal computers are often working against them," notes Syllable's website. "Yet they are based on the same technology as the little computers that are helpful all during the day. Personal computers are far more powerful machines, so they should also be far more helpful, shouldn't they? Well, sometimes they are, but often they are not." Techworld Australia caught up with lead Syllable developer Kaj de Vos to talk about the project and its philosophy. Read the full Q&A with Kaj de Vos. "The stated goal of AtheOS was to be a hobby OS, where development was for its own sake," de Vos explains. "The main reason for starting Syllable, apart from saving the project in the first place, was to make it a serious attempt at a usable system, because it had the potential to be [such a system]." There are currently two flavours of Syllable. 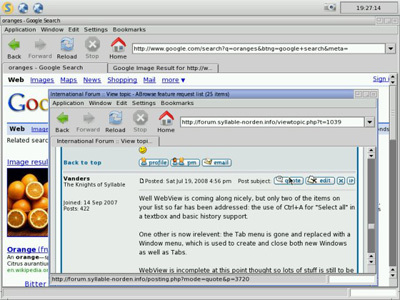 The original version is 'Syllable Desktop'; an end-user OS intended to offer "best practices in desktop system design". "It is meant to improve on mainstream user oriented systems, that we feel are failing to meet these goals," de Vos says. The desktop edition of the OS is very compact and has very low minimum specifications: A Pentium processor, 32MB of RAM and 250MB of hard drive space. There is also Syllable Server; however, unlike the desktop version it is a Linux-based system. "Part of the reason for the creation of the desktop system is our criticisms of user-oriented Linux systems, but Linux server systems are often superior to others." Despite this difference between the two versions, there is some synergy: "We routinely develop a component first on Syllable Server, because third-party projects already make sure it works on Linux. When that integration work is done, we can continue by making it work on Syllable Desktop, which is often a greater challenge due to its unique characteristics." "Both Syllable Desktop and Syllable Server can run on much smaller machines than other modern operating systems," de Vos argues. "They start faster, often perform faster and use less memory and disk space."